The ceremony was beautiful, the dinner was delicious and you’re guest don't want the party to end. This is the perfect time to finish the night with a bang! 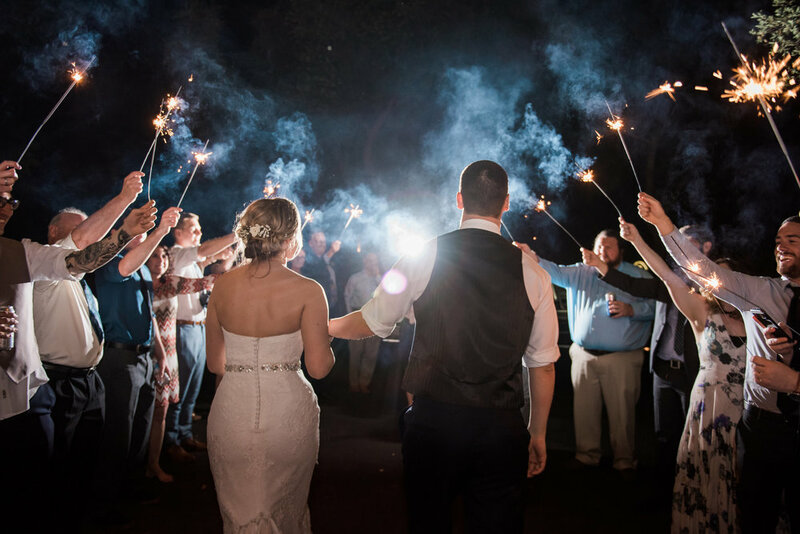 A sparkler exit everyone will always remember and the perfect way to end the evening. Who has the sparklers? Here at The Wright House our coordinator will hold on to the sparklers until it is time. This will help you in making sure no one gets into before it is time. How do your guests access the sparklers? The coordinator should work with the DJ to make sure that after the last dance there is an announcement about exiting to where they can grab a sparkler for the Sparkler Exit. From there your coordinator can hand one to each guest as she/he lines the guest up in two lines. Sparklers are fire; to be safe please keep lit sparklers an arm length from you and high up in the air for when the Bride and Groom go through the line. Please make sure there are not children or any other guest in front or below your sparklers – everyone should be in a nice straight line. To light sparklers it is easy – a few sparklers will be lit please touch the sparklers tips to light your sparklers and the ones around you. It will only take a few seconds to light the sparkers. What happens when the sparklers are lit? When the sparklers are lit and high up in the air – your coordinator will give you the okay to walk thru the lines of guest. It is best to take your time when walking thru the line. Give your bride/groom a big kiss in the middle of the sparkler line for the best photo opt. What do guest do after the sparkler exit is over? After you have gone thru the line and the sparklers are at the end of their life spam your coordinator will have a large tin bucket for the sparklers to be placed in after they are completely out. Do not use matches to light sparklers. They do not burn long enough to raise the heat of the sparklers to be light. One sparkler per person is just enough! Two sparklers will for each person will cost you more plus put your guest at a better chance of burning themselves. You do not need more than 2-3 barbecue lighters to light over 150 sparklers. The key is to light a few throughout the line to help light all other sparklers. Sparklers lit by another sparkler will light almost instantly. I promise! Best sparkler size is 20 inches – Smaller sparklers go out too fast! When the sparkler is XL you are mostly likely to burn someone (bride/groom) if the two lines are too close and they last long after and guest have to wait a while to put the sparkler in the bucket. Sparklers are fire and can burn clothing, hair, and people. Please make sure to handle with care and safely.